We remain long Latam FX but mixed February performance makes us consider hedges. The Fed’s dovish tone and warming of China-US relations make us believe that a buy-on-dips strategy remains appropriate for now. FX valuations have become more concerning, and some optimism regarding reflationary dynamics (as shown by the disappointing China manufacturing PMI print) make us, on the other hand, prefer to maintain some defensive hedges as well. Stay long though despite some risks surfacing. The large rally in international oil prices YTD should continue to buoy COP, and we maintain that – despite COP’s strong performance - our valuation models continue to screen it as cheap. 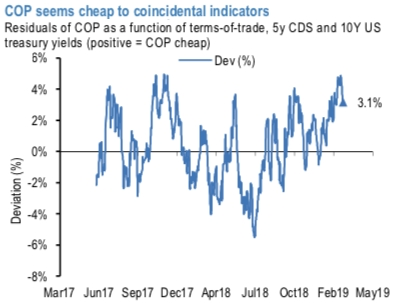 More specifically, normalized residuals of COP as a function of terms-of-trade, 10-year treasury yields, and the 5-year CDS, are showing the peso as 2.8% cheap (1.2 sigma, refer above chart). Hence, we maintain our overall long Latam FX position in JPM’s GBI-EM portfolio (via BRL, COP and PEN) and our outright trades on hedging grounds: short USDARS 12m NDF (+3.0%), ahead of Brazil’s current account and FDI flow and Mexican retail sales data announcements we advise long BRLMXN (-3.2%), Buy 6M 25D BRL calls/JPY puts vs USD puts/BRL calls, equal vega. Currency Strength Index: FxWirePro's hourly USD spot index is at 21 (mildly bullish), EUR is at -100 (bearish) and JPY is flashing at 111 (bullish) while articulating (at 12:45 GMT).